Technical note: In order to make the homepage load faster and also allow readers to more easily scroll past posts that aren't of interest, I've implemented an 'expandable post option' on posts that have several photos (which seems to be most of them lately). After the first or second photo, look for the 'read more' link. Just click on that link, and the post will expand so you can see the entire thing. Thanks for making this high tech move with me! 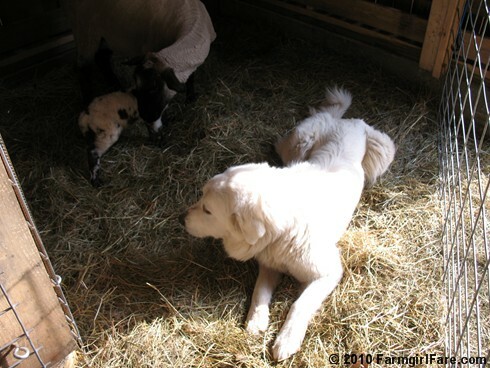 New visitor note: Welcome to the farm! We're so happy you're here. 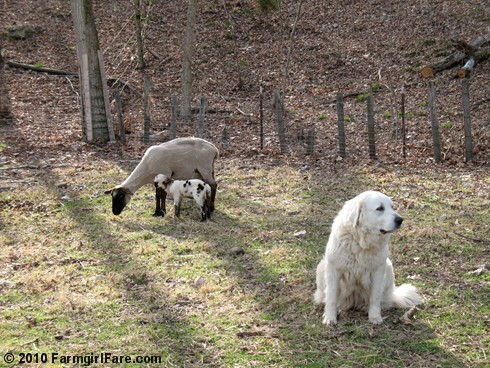 It's lambing season right now, which means this blog has been temporarily taken over by sheep. Rest assured, there's usually a lot more going on, including plenty of sweet and savory Less Fuss, More Flavor recipes. If you'd like to see something other than this annual profusion of bouncing baby cute, you'll find links to all the monthly archives since 2005 over in the left sidebar, and a rather disorderly list of all the recipes posted so far (I'm working on a recipe index!) in the right sidebar. Enjoy! Current Lamb Count: 9. Sets of twins: 4. Ewe lambs: 5. Ram lambs: 4. Number of friends arriving on Wednesday from England for a week long farm stay: 1! © Copyright 2010 FarmgirlFare.com, the counting sheep but not getting much sleep (or much of anything else done!) 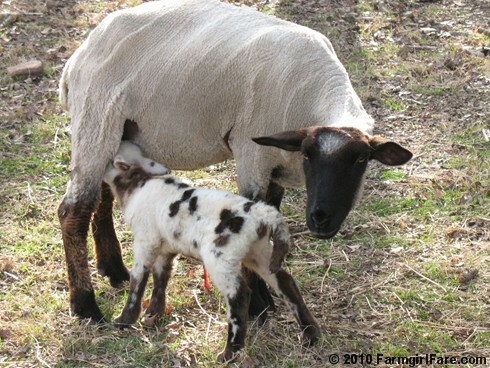 foodie farm blog where no matter how many lambing seasons you go through, it's always an amazing time of year—and this happy and healthy little girl (who is actually a rather big girl) is so incredibly soft it's unbelievable. She's a BIG girl. Where are you getting all these spotted lambs from? Is the ram spotted? Do you dock the tails on the lambs? At what age? 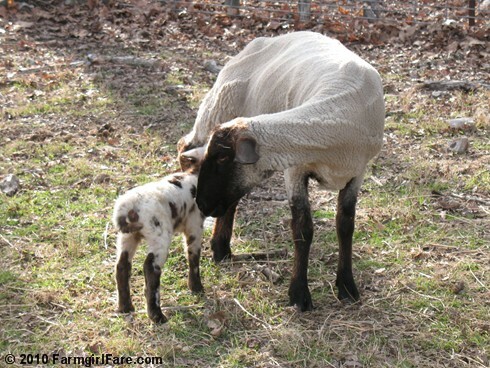 Love the lambing season pictures and commentary, I miss raising sheep! Gosh! I'm overdosing on cute! Everyday is cuter than the last (if that's even possible) These babies and their mamas are just adorable!! Thank you so much for these pictures. I think I'm in lamb love. She has got to be the most adorable thing I have ever seen! And is she ever fluffy looking. I'm already looking forward to seeing which names you pick to go with these cute little faces.... do you think I might be getting ahead of myself? she's so cute, she's like a little dalmation lamb LOL - when I was little we would always go stay at my grandparents in the summer and my great aunt who lived next door raised lambs, I always hoped we would get there in time to feed them with a bottle! Hmmm.... something just popped into my head, and after going back and rechecking what I had remembered I realized I was right. 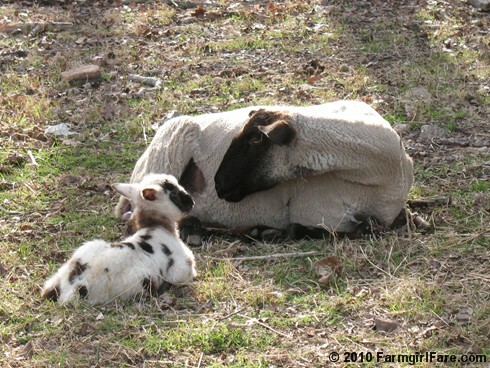 Remember oh so long ago, during that certain Sheep Naming contest that we all loved... a promise was made to runner up contestant and MVP award winner that in 2010 the softest and fairest female lamb will be named Guinevere. I know that we haven't seen ALL of the babies yet but I'd just like to say that I think THIS is Guinevere. OH I lOVE the spots! Oh! I think she may be the cutest yet this season! LOVE those spots! Oh my gosh, they're SO cute! What do you do with spotted wool? So adorable! Those spots are just darling... thanks for sharing the photos and the experience! I realize you can't please everybody, but I prefer scrolling through the full content of your posts. I don't visit every time you post and find it annoying to have to click to read more on multiple posts. Besides, how could someone not be interested in what you post?